The pear shaped diamond is also called the “teardrop diamond” because of its shape. The pear shaped diamond is a combination cut of the round-brilliant and the marquise (to see examples of these two shapes, visit our diamond shapes page. The Pear Shaped Diamond is a fiery cut with lots of wonderful sparkle and flash. The elegant lines of the Pear Shaped Diamond lends a sophisticated air to both the simplest and most elaborate ring settings. When purchasing a Pear Shaped Diamond, it’s extremely important to pay attention to quality and to select the highest grade cut you can afford. Pear-shaped diamonds are prone to two cutting issues: the bow-tie effect and “high” or “uneven” shoulders. The image to the left is a simulation of the bow-tie effect. It’s not unusual to see “some” bow-tie if you examine a pear-shaped diamond from various angles and in different lights, but what you don’t want is an obvious black/dark spot that is dull from every angle and in all lights. If you’re “wondering” if the diamond you purchased is suffering from the bow-tie effect, it probably isn’t. It’s one of those defects, that, when present is obvious. The picture to the left is a simulation of “uneven shoulders”. The non-pointed end of the pear shaped diamond should have a nice round and gentle arc. In addition to “uneven shoulders”, sometimes cutters, to increase the carat weight of the diamond “square off” or give a “rounded triangle” end to the pear-shaped diamond. High-shoulders and uneven shoulders decrease the value of the diamond and should be avoided. Always be sure to check the length and width of the diamond prior to purchasing. The traditionally accepted ratio for Pear Diamonds is 1.70:1 to 1.45:1, but some people prefer longer, thinner cuts, and some prefer the shorter, fatter cuts. While not the traditional shape selection, Pear Diamonds make lovely engagement rings (either as a solitaire or with accent stones). It’s a beautiful cut with lots of sparkle and generally considered to carry a more dramatic flair than the traditional round diamond. That said, whenever choosing a non-traditional diamond shape, it is always good to ensure that the recipient will be as enamored of the shape as the giver. How to Wear a Pear-Shaped Diamond Ring? The best answer? Wear the ring the way you prefer, there is no standard (or even strong tradition) for the “point” direction, and no right or wrong answer. Many wearers feel that wearing the ring pointed toward the fingernails provides a slimming look for the fingers. Pear Diamonds require specialized settings — particularly with an added prong to protect the point of the diamond. The example here shows a six prong setting. 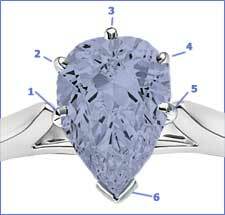 Five prongs support the bulk of the diamond and the sixth prong supports and protects the fragile point. To give you some ideas of what’s available for a Pear Diamond ring, we’ve preselected a range of certified Pear Diamonds for you to examine (all from James Allen and Blue Nile, two premiere diamond stores). Except for the “Bargain Basement” selections, these diamonds are within our minimum requirements as listed above and are suitable for solitaire settings or settings with accent stones. *PLEASE NOTE: All “Bargain Basement” diamonds fall below our minimum specification standards in one or more categories.